pTrumpet is the world's first ever fully plastic trumpet - a fully functioning Bb trumpet, designed in the UK for musicians by musicians. It comes in its own, smart gig bag along with a 3c and 5c mouthpiece. Authentic trumpet is a truly authentic musical instrument that has sparked a revolution in the way the music industry thinks about trumpets. trumpet follows in the footsteps of its sister instrument, pBone, the world's best selling trombone. Innovative trumpet is the only trumpet with a fully plastic valve system, which we have designed and developed to create unrivalled lightness, durability and sound quality. 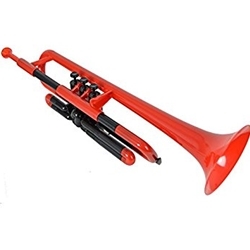 Accessible trumpet is less than half the weight of a brass trumpet due to the plastic material throughout the whole instrument, so it's ideal for the younger player and for all those who may have difficulty with the weight and balance. Mouthpiece We have designed fully plastic mouthpieces especially for the trumpet. Each instrument comes with both a 3c and 5c trumpet mouthpiece, you can also use any standard metal trumpet mouthpiece in the trumpet. Adjustable tuning slides The all-plastic main, first and third valve tuning slides give you the flexibility of tuning that you would expect of any trumpet. BioCote Protection For the first time in a musical instrument, trumpet incorporates patented anti-microbial technology from BioCote, which provides the highest standards of protection. Pitched in Bb4.75 inch Bell Unique fully plastic valve system One piece patented lead pipe All plastic water key Adjustable main tuning slide Adjustable 1st and 3rd valve tuning slides Weighs just 500gWorks with any standard mouthpiece Includes fabric carry bag.